Collects Star Wars: The Force Awakens Adaptation #1-6. It’s true — all of it! The blockbuster movie jumps from the big screen to the comic-book page! It’s been three decades since the Rebel Alliance destroyed the Death Star and toppled the Galactic Empire — but now, on the remote planet Jakku, there is a stirring in the Force. A young scavenger named Rey…a deserting Stormtrooper named Finn…an ace pilot named Poe…and a dark apprentice named Kylo Ren… Their lives are about to collide as the awakening begins. Writer Chuck Wendig (Star Wars: The Aftermath Trilogy) and artist Luke Ross (HERCULES) take us back into the saga of a lifetime! 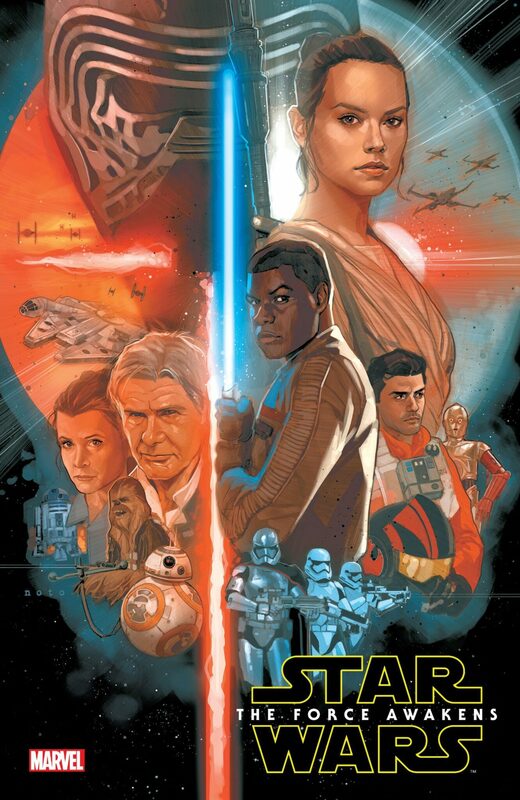 Cover art by Phil Noto.